My friend and professional photographer Michelle Ellis stopped by last week to take the final cover photos for my forthcoming cookbook Vegan Lunch Box Around The World. For the cover I wanted something special, so I chose my son's number one favorite lunch from his first year at school. That turned out to be the lunch I packed him for Chinese New Year: Tofu Char Sui on a bed of brown rice, Teriyaki Green Beans, a steamed dumpling filled with sweet bean paste, mandarin orange segments, and kiwi fruit. I set up three different Laptop Lunch Boxes to provide the cover designer with three different looks to choose from: a sophisticated, more adult look in a black bento box, the more playful purple bento to the left, and the adorable, pink, child-friendly smiling dumpling bento above. Guess which is my favorite? You can see more images, including the "sophisticated" look, at my Flickr photostream. Mmmmmm....I can't wait for the new book! I hope the dumpling recipe is in there! I am assuming it's red bean paste? LOVES IT! EXCITING! 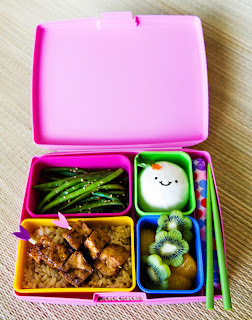 My favorite bento is the pink one, so adorable! I love the smiling dumpling! >>does shmoo make his own lunches based on the holiday/time of year? Oh no, not at all. He's almost 11, and has very strict "no cuteness" rules about his lunches now. I like photo #'s 7 and 9 on the Flickr photostream. Great job! They all look deelish! Oh I can't wait for the around the world recipes! I love the "no cuteness" rule... I can totally see an 11-year old being a little put off by opening his lunch around a group of friends and them all seeing a smiling steamed dumpling! But, I definitely want to learn how to make those dumplings. I can't wait for the new book. I just pre-ordered it at Amazon. Oh, I hope it's the one with the face! So cute! Ooh, I love them all! Especially the smiley bun from pink bento. I wouldn't recommend using the ones with the chopsticks sticking out of the green beans. Leaving your chopsticks stuck into your food is considered bad manners, much like leaving a fork standing in your scoop of mashed potatoes would be. that kiwi fruit is beautiful! the kiwi is so cute! I'm excited about the new book! what beautiful and colorful lunches. Your son is so fortunate! How did you get the designs on your dumplings? They are so cute! What a fun blog, you have so many good ideas! but you used to have a link to a chinese website that sold fake animal products like fake shrimps and fake wings and stuff, i cant remember what it was called. it was like mai wei or something to that effect, do you remember what it was? >>How did you get the designs on your dumplings? They are so cute! Thanks so much Jennifer that was exactly what I was thinking of! Sorry to like, ambush you but, you know how frustrating it is to have something on the tip of your tongue like that lol. Wow -- just by reading all of this, I can't wait to experiment over the summer with my children. I'm no vegan, but I do tend to create veggie meals once in a while. I've been following this blog for a few years and your presentation is awesome, yet so simple! Wow what great ideas. 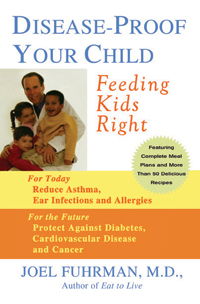 I have five vegan kids and I will be getting myself a copy of the book asap! Yum. Will you pack my lunches? We've selected you as our Foodista Food Blog of the Day for this Saturday, July 25th! Your blog on “Cover Photos for Around the World” will be featured on the Foodista homepage for 24 hours. This is a new feature that we recently launched and are thrilled to post your blog. We are really enjoying your blog and look forward to seeing your recipes, tips and techniques on Foodista! Foodista- The Cooking Encyclopedia everyone can edit! that tofu looks amazing!! I need to get this cook book! Your son is the luckiest boy on the planet to have such a wonderful mom. 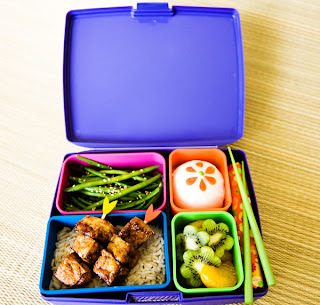 The lunchboxes above are so cute & I love how the food is healthy and still looks delicious.